If you're going to write on the go, the Fisher Space pen is the tool you need. Folded up, it'll fit anywhere your journal will go -- and it has no sharp edges to gouge your phone or PDA or scratch your leather journal. Unfolded, it's a full-size pen. But it's not an ordinary pen. If you need to write in an awkward position -- leaning against the a wall during a downpour in Prague, writing against the window of a railroad compartment -- the space pen will work flawlessly. It'll write upside down. It'll write cleanly in the rain. It'll even write underwater. If you never seem to have a pen handy, this is the pen for you. Folded, it's small enough to fit comfortably in any pocket. You won't be tempted to leave it behind. 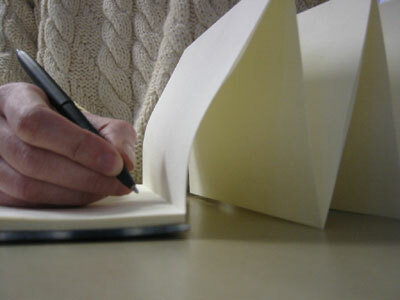 Unfolded, it's a comfortable, sturdy, full-size pen. It won't get scratched by keys or loose change, and it won't scratch your cell phone or wallet. It won't leak, ever. We've got three special, hard-to-get versions of the Fisher Space Pen. The X750 is black, textured, with a special soft grip. 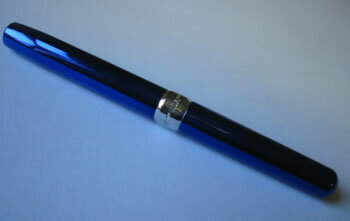 We've even got the beautiful new BLUE X750 -- a deep, rich metallic blue with real impact. 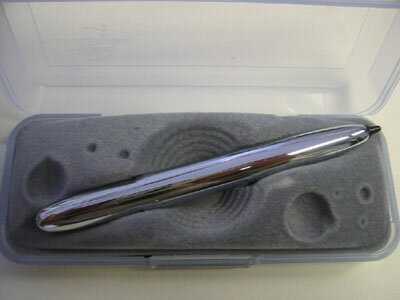 Plus, we've got a new Space Pen model that's the same size as the traditional bullet, but has a convenient PDA stylus on the back end for your palmtop device. 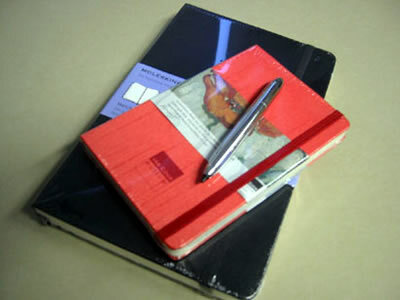 Folded, the space pen is smaller than a pocket Moleskine. Unfolded, it's a full-size pen.